Facebook’s COO Sheryl Sandberg announced that the tech giant was making changes to help users grieve for friends who had passed away. Facebook Chief Operating Officer Sheryl Sandberg speaks during an event on the sidelines of the World Economic Forum in Davos, Switzerland January 23, 2019. Facebook unveiled artificial intelligence (AI) tools and new features to prevent upsetting users after their friends or family have passed away. In a blog post on Tuesday, Chief Operating Officer Sheryl Sandberg said Facebook was taking several steps to support its users following the loss of someone close to them. The platform will introduce a new "tributes" section alongside its existing memorialization tool, which allows a profile to be transformed into a memorial for a person after they die. The new section will allow others to post messages to the profile of a deceased person in a separate tab from their timeline, preserving the timeline as it was left. Meanwhile, improved AI systems will prevent a dead person's profile from appearing to others in "painful ways." This will stop unexpected notifications, such as birthday alerts or recommending the person be invited to an event, which will be barred once someone dies even if their profile has not been memorialized. Sandberg added that legacy contacts – a person nominated by a Facebook user to take control of their profile in case of their death – will be given more controls. They will be able to moderate the posts shared to the new tributes section, change tagging settings and edit who can post or see posts on the profile. 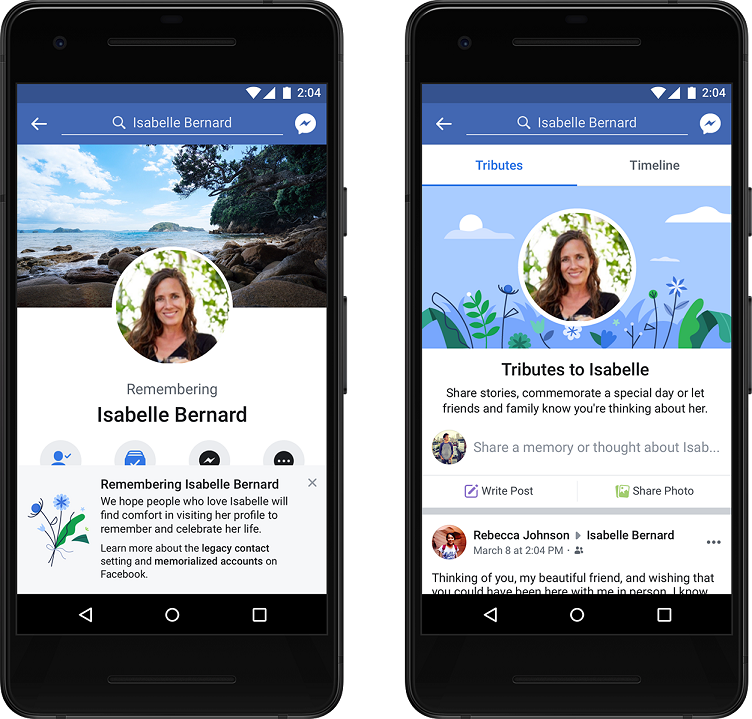 Minors are unable to nominate legacy contacts, but Facebook recently changed its policies to allow parents who have lost children under the age of 18 to request to become their legacy contact. "We know the loss of a friend or family member can be devastating — and we want Facebook to be a place where people can support each other while honoring the memory of their loved ones," Sandberg said in the post. "We'll continue to build on these changes as we hear more feedback. We hope Facebook remains a place where the memory and spirit of our loved ones can be celebrated and live on," she added.